Whoever says dogs can’t drive is probably right. While it’s true that these pets love a good old ride, it’s probably best that they are not left alone in a car for a long time. Take what happened in Wayne, West Virginia. Two innocent looking pups decided to take the wheel and have a little fun on their own when their owner left them for a moment in the car with a motor still on. You can imagine the shock a Walmart employee felt when she noticed a car, with a headless driver, coming right towards her. She was able to jump out of the way and thought that she was getting pranked by someone she knew. 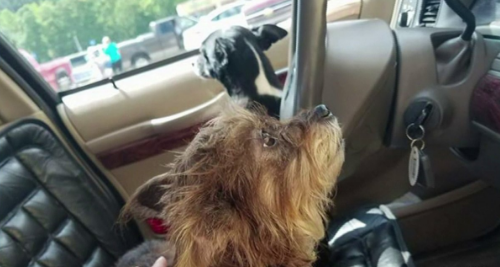 When she got a closer look on the car, she was surprised to see nobody except for two puppies—one holding the steering wheel and the other rolling down the window. Both of them were comfortably sitting in the car and were acting like what they’re doing is perfectly normal. What occurred is, of course, not normal, but it’s the Wayne County so what do you expect? It’s lucky that no human, dog, or Walmart wall was harmed that day.